Fusing only the best elements from blues, metal and rock n’ roll, Arkansas-based rockers Shawn James and the Shapeshifters describe their eclectic, frenzied sound as “Rock and Roar.” Their most recent release, The Gospel According to Shawn James and the Shapeshifters, features some of their most ambitiously soulful pieces to date with plenty of fiddle, banjo and heavy guitar to accent frontman Shawn James‘ richly fervent vocals. James and the Shapeshifters are in the midst of a countrywide tour and are preparing for their upcoming stop in Salt Lake City and on May 8 at Liquid Joe’s. SLUG: There’s Shawn James the solo artist, and there’s Shawn James and the Shapeshifters. Who are the Shapeshifters? What does that name impart to your music? James: The Shapeshifters are the group of Arkansan musicians who make the songs I write bigger than they could be on their own. The name imparts three things: 1. I’m obsessed with mythology and folklore, and those subjects find their way into my music constantly. 2. We don’t limit ourselves to just being one genre, so we “shapeshift” in between them. 3. Band members sometimes come and go because of life’s unforeseen issues … I knew this would be the case, so the name also reflects that. SLUG: Will Salt Lake experience any solo Shawn James? What separates your solo act from your band? James: This tour will primarily focus on the “Rock and Roar” style we’ve been playing lately. I may break out a couple solo songs here and there, though. The solo act is much more blues, gospel, folk and soul-influenced, one-man-band style, whereas the band is all over the place but mainly more of a heavier rock sound with little tinges of metal, gospel and folk. SLUG: What challenges do you encounter in keeping both your solo act and your band active and touring? James: I think the toughest challenge for the band would be the members sometimes. Like I said earlier, life has a way of throwing things off when you think everything is solid, and we’ve had to part ways with some very talented musicians, but we’re also fortunate enough to have other just as talented folks to fill their shoes. The solo act is much simpler since it’s just me, but sometimes the struggle is pleasing everyone who wants a specific style that I might do. Some folks don’t like the heavier style of the band, but my desire is to keep both going, so that is what I’ll do. SLUG: There seems to be a heavy storytelling element in most of your songs. Where do you get your lyrical inspiration with regard to storytelling? James: Legends, mythology and folklore mixed with my real-life experience. I like to take real things that happen and then fantasize them into a grander scale, lyrically. SLUG: On this particular tour, you are really hitting every corner of the country. What surprises have you run into, and what places are you most excited for? SLUG: What new music is in the works for Shawn James and the Shapeshifters? What are your plans for the rest of 2016? James: I’ll be releasing a solo album called On the Shoulders of Giants on June 17 that really focuses on a darker, grooving blues, one-man-band sound. The band will continue touring throughout the year and writing more songs, but we have no releases planned this year for the Shapeshifters as of yet. SLUG: In 2013, you recorded a video at the Colorado W.O.L.F. Sanctuary that went viral on Youtube. Not only did the wolves join in while you were performing A.A. Bondy‘s “American Hearts,” but you can also see them howling in the background. What was that experience like? Is there any chance you’ll go back to relive that experience? James: It gave me chills and it’s very hard to explain, but it was so surreal. I never imagined that it would happen like that. I doubt I could ever recreate that moment. It was just perfect with the blizzard going on and everything else. I plan on visiting more wolf sanctuaries in the future, but I doubt any will have experiences like that one. SLUG: Though you are originally from Chicago, you’ve made Arkansas the home base for Shawn James and the Shapeshifters. What about Arkansas called to you musically? What artists from Arkansas, or qualities of Arkansas itself, inspire you? James: I had friends in Arkansas that always wanted me to come down, and finally, I did it. When I visited, I fell in love with the small-town vibe it had, but it’s also a college town, so there’s always new blood coming through and it keeps it interesting. Arkansas is also one of the most beautiful places I’ve ever been to once you get into the Ozark Mountains. I would say the natural beauty and the creative people from [Arkansas] are the aspects that inspire me the most about Arkansas. SLUG: What can someone expect from a Shawn James and the Shapeshifters show? You’ve mentioned in your bio that a Shawn James and the Shapeshifters live show is “surprising.” What might we be surprised about? James: They can expect us to be energized, intense and ready to rock. People get surprised sometimes, because we really do put our all into our live show. We’re sweating passion and emotion, and I think people don’t always feel that level of dedication and love for what other bands do—or rather, other bands don’t really let go and move people with their performance. 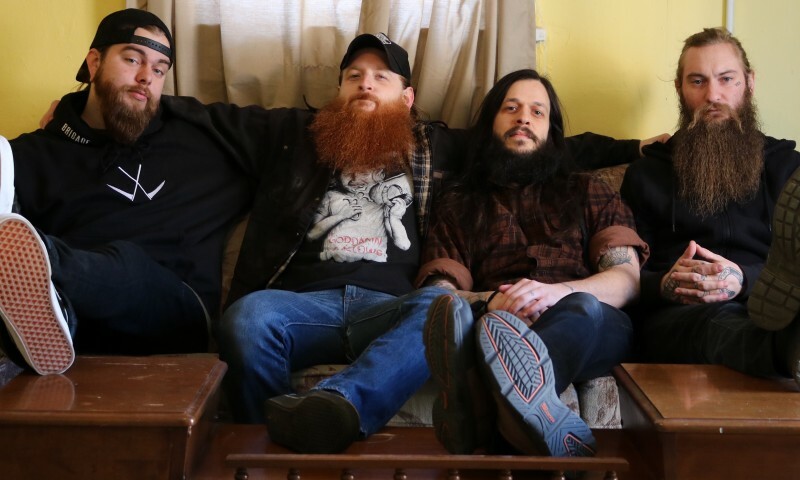 Catch Shawn James and the Shapeshifters as they bring their high-energy “Rock and Roar” to Liquid Joe’s on Sunday, May 8 along with In the Whale. This is a 21-plus show. For more information, visit shawnjamesmusic.com.